My connection with Yosemite National Park began long before I ever set foot within the state lines of California. I was captivated by the larger-than-life stories that descended from the steep granite walls and covered the pages of climbing magazines. The stories depicted timeless tales of adventure, discovery, and passion through the eyes of climbing legends. Yosemite Valley has long been considered the mecca of long, hard rock climbing, but there’s more to it than that. There’s an energy within the Valley. An energy that drives climbers to push hard and redefine the boundaries of what they thought possible. I could sense this energy from the other side of the country, and I felt both curious and compelled to experience it first-hand. Of all the routes scattered throughout the Valley, there was one route in particular Adam and I had our hearts set on – the Nose. The Nose runs directly up the center of El Capitan, a 3,000 foot formation once considered impossible to climb. In 1958, after being beat to the first ascent of Half Dome, Warren Harding decided to take on the challenge of climbing a wall harder and taller than anything ever considered before. After 45 days of aid climbing, fixing ropes, and ascending and descending over the course of 18 months, Harding, Wayne Merry, and George Whitmore became the first to top out what would come to be considered one of the best rock climbs in the world. With this feat began an obsession among climbers to contribute their own mark in the history of this monolithic rock. In 1960, Royal Robbins, Joe Fitschen, Chuck Pratt, and Tom Frost, made the second ascent and the first continuous ascent (from the ground up in a single push) of the route, climbing it in merely seven days. As the years passed, the amount of time elite climbers required to scale the route shrank considerably. In 1975, the first Nose in a day (NIAD) ascent was completed by John Long, Jim Bridwell, and Billy Westbay in just under 15 hours. Almost 40 years later, the speed record for climbing the Nose is now an incredibly competitive time of two hours, 23 minutes, and 46 seconds (set by Alex Honnold and Hans Florine in 2012), although most climbers take anywhere from three to five days to top out the route. Adam and I poured a great deal of time, money, and heart into our dream of climbing the Nose. As we built up our rack, we did so in a systematic way, purchasing gear we needed for that specific climb. The plastic walls of our university climbing gym became our figurative big wall, as we learned how to jumar efficiently and practiced aid climbing techniques, such as lowering out. Chris McNamara guided us, as we read his book How to Big Wall Climb, and followed his advice for becoming fast, efficient big wall machines. Every route we climbed was a building block, leading us closer and closer to our goal. In October of 2013, we finally made our sacred pilgrimage to Yosemite Valley. As we descended down the winding Big Oak Flat Road onto the valley floor, I strained to make out the abstract shapes through the thickness of night. I felt like a small child who had been following the dotted lines across a treasure map. The riddled stories from Climbing Magazine and Rock & Ice had led me here, and as the van curled around the road’s corner I finally saw the treasure it had led me to. The faint silhouette of a massive rock face towered above, although the true scale of it was hard to comprehend in darkness. The only clues were a handful of stars shining brightly – headlamps of climbers among a sea of granite. Me leading up the first pitch of The Nose on a practice run. When daylight broke, we walked into El Cap meadow and feasted our eyes upon the formation for our first time. Infinite amounts of emotions washed over me. I felt small. Excitement coursed through my veins, knowing half of my dream had already been realized, and as my thoughts drifted to the other half of that dream, my nerves floated to the surface. The thought of climbing El Cap seemed daunting. Although we were not yet ready to tackle the entire route, what better way to prepare then to practice on the route itself. Over the next eight months, in between other climbing objectives and big wall routes, we made day trips climbing the starting pitches and slowly became faster and more efficient. The ground that originally took us four or five hours to climb, we were now covering in just over an hour. Soon we were climbing to Dolt Tower and El Cap Tower with daylight to spare. 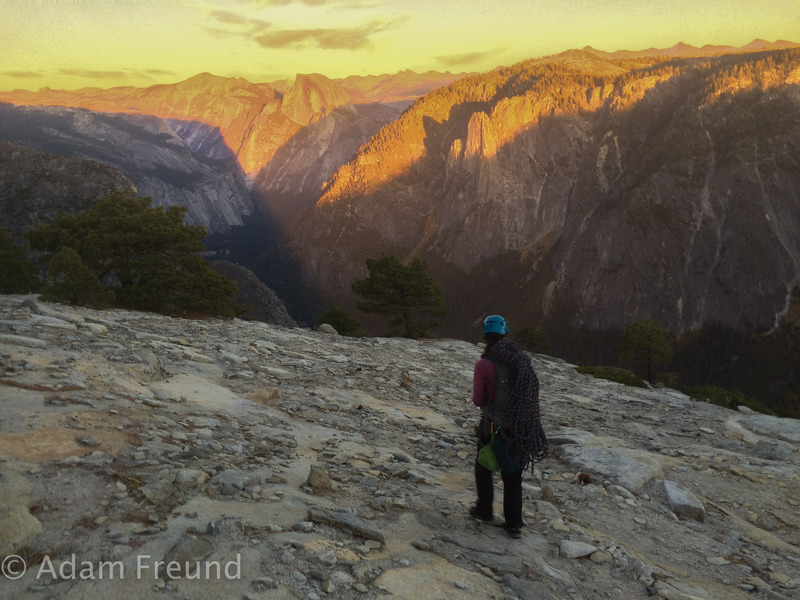 We had reached a point on the route where it made more sense to commit to the full route than spend the time rappelling back to the ground, however, our season in Yosemite had come to an end. Come fall, we would finally be ready to tackle the Captain. Climb, fix rope, jug, haul. 30 pitches of steep and exposed rock hovered above us. Climb, fix rope, jug, haul, repeat. Four pitches climbed. We were just about to Sickle Ledge as the sun awoke. Two British climbers were reorganizing gear as we dragged our haul bag up over the lip of the ledge. A decapitated plastic zombie head hung from their haul bag, bobbing to the sound of The Arctic Monkeys, which played softly from a single speaker tied into the anchor. They introduced him as Desmond and explained, “We send him out on the necky leads”. The Brits graciously let us continue ahead of them, and as we started up the next pitch they both settled down next to Desmond and lit up their cigarettes. Climb, fix rope, jug, haul, repeat. Climb, fix rope, jug, haul, repeat. Eagle Ledge, the location of our first night’s bivy. It is estimated that roughly 60 percent of climbers who start up the Nose with intentions of climbing the entire route bail before making it to Dolt Tower. Why? According to Tom Evans, a photographer and former climber who devotes his time to photographing climbers on El Cap, most climbers are unprepared for the sheer size of the wall. He states, “El Capitan is way bigger than most people think. They jump on the Nose without practice, so when the first glitch arises – and one does on every wall – they just bail.” Chris McNamara, who has climbed El Capitan over 70 times echoes the same thought, “On a one-pitch climb or even on a 10-pitch climb like Washington Column, you can make basic mistakes and still get your way up the wall. When you jump on a 30-pitch route, those little mistakes and inefficiencies compound and you have to bail.” Our practice had paid off. It was midafternoon when we topped out on Dolt Tower, 11 pitches into the climb. We had planned to spend our first of three nights on Dolt Tower, however, with a decent amount of daylight left and high spirits we decided to push through a few more pitches. As the sun tucked itself beyond the horizon, we finished the final pitch to Eagle Ledge. A small twinge of disappointment hit us. The ledge was quite a bit smaller than what we had hoped for, however, our fatigued bodies gladly accepted any offer of rest. We spent the night dancing from one position to another to prevent pins and needles from creeping into our arms and legs. Fall asleep, reposition, repeat. And so the night went. Mayan Smith-Gobat cruising past us. Stiff legs forced us awake at sunrise. We watched the edge of sunlight slowly dip lower down the wall as the sun rose higher and higher, until its warmth splashed our faces. A sea of granite rose steeply above us and, like a wave impinging on the shore, jutted out below us. Gravity felt very real. Climb, fix rope, jug, haul repeat. We could hear the sound of two women preparing for King Swing (a giant pendulum to get from one crack system to another) and excitement crept into my stomach. A woman in bright green pants came flying from around the arête below us and pulled onto Eagle Ledge effortlessly. It was none other than Mayan Smith-Gobat, a professional female climber from New Zealand, who was after the women’s speed record on the Nose. Our jaws dropped as she floated up the pitch below us in minutes without placing a single piece of gear. She started up friendly small talk as she climbed quickly and efficiently past us to the top of the next pitch. When she reached the anchors, she fixed the rope and called to her partner Libby Sauter, who came soaring around the arête in a tangle of ropes, cursing and fighting her way up after Mayan. We were watching a piece of El Capitan history in the making and we knew it. (Mayan and Libby now hold the women’s speed record with a time of four hours and 43 minutes. Check out a video of their efforts here.) Our motivation skyrocketed. A new sense of inspiration washed over us and we charged full speed ahead. Climb, fix rope, jug, haul, repeat. Climb, fix rope, jug, haul, repeat. Looking down at the start of the route and broccoli trees. We made it to Camp IV, the site of our second night’s planned bivy, by early afternoon and pushed on without second thought. The Great Roof hovered above us, growing larger and larger with each pitch. Climb, fix rope, jug, haul, repeat. Adam leading the Great Roof pitch. The rich history of climbing is etched upon the walls of the valley, like an open book begging to be read. Each pitch we climbed revealed another chapter of the route’s past. While some stories fade with time, the signature of these iconic figures will forever be written in the routes they left behind. It was palpable as I crossed beneath the Great Roof. 2,000 feet of air bounced beneath the ground and my feet. I was passing through the same spot Warren Harding passed on his first ascent of the route in 1958. Rusted pitons and old fixed stoppers scattered the crack. It was the same crack Lynn Hill climbed on her ground breaking first free ascent in 1994. I lowered out from underneath the roof, and as the sunlight hit me I found myself pulled back to the present moment. Climb, fix rope, jug, haul, repeat. Our night at Camp V was lavish. Adam and I could fully lie down next to each other with room to spare. Cold soup and Pad Thai has never tasted so good. I counted the shooting stars streaking across the navy sky as I fell asleep. Adam and I at the top of pitch 30. One pitch left to the top. Seven… six… five pitches to the top. Climb, fix rope, jug, haul, repeat. It seemed surreal as we hung at the wildly exposed anchors – a long-term dream about to be realized. I savored the last pitch. Climb, fix rope, jug, haul, but this time we didn’t repeat. This time we hugged and celebrated the beauty that surrounded us. We celebrated years of hard work and the feeling of solid ground beneath our feet for the first time in three days. As we packed up our climbing gear and coiled our rope we watched the sky light up with shades of pink. Golden light reflected off the faces of Half Dome and Sentinel across the valley. Adam and I looked at each other with the same thought – what next? The sun setting as we head down from the top of El Capitan. Great and inspiring writing! Just beginning to touch upon the idea of climbing this route, and I am more enticed after reading this. Thanks! Thank you for the awesome write up. I am beginning my training and just being. I have been a canyoneer out in Zion and now have my eyes set on the big walls. I have been doing mostly sport but have started to build my rack and practicing. Is this route bolted much or mostly all trad until you get to the anchor stations? thanks so much! climb on! Best of luck preparing for The Nose – there’s definitely a lot to learn and practice when it comes to climbing big walls! The Nose is definitely a trad climb and requires a fairly large rack. I would recommend checking out Chris McNamara’s books “How to Big Wall Climb” and “Road to the Nose”. They offer great advice on the gear and experience you need and how to best prepare. Good job and thanks for the share! I live in Truckee and am wanting to do the Nose this year. I’ve been studying Chris’ book also ‘How to Big Wall Climb’. What was your free climbing level when you did the route and up to what grade did you free? (This would be a good guide to see what we are able to do in 3 days also). Can you give any tips to a first timer on the Nose? What method did you do the King Swing..I’m reading several different methods. Thanks for any additional beta! 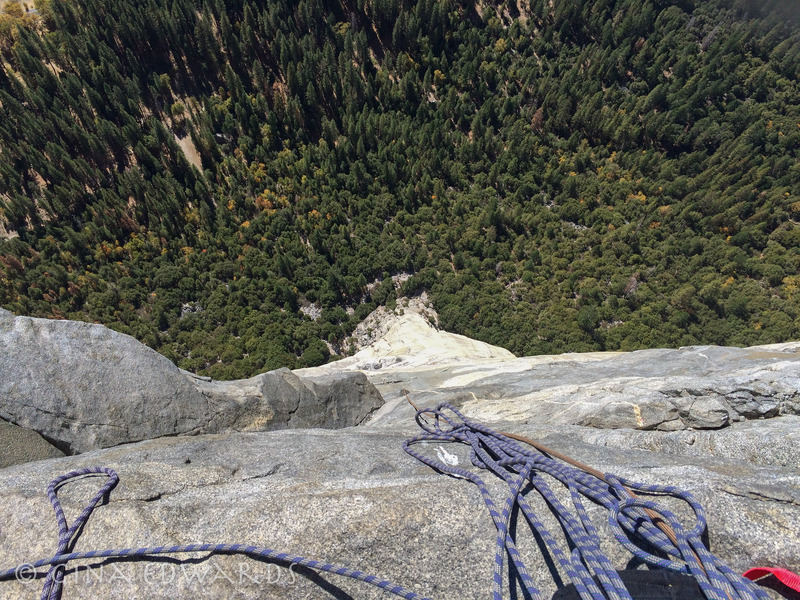 Freeclimbing level: Yosemite 5.11d, however, we didn’t set out to try to free any of the route (except P0 and P1). We were just trying to be as efficient as possible, which usually meant French freeing. We found the most efficient way was to French free from the start to El Cap Tower (no aiders, just step in and leave an occasional sling if needed). We used aiders on maybe 20% of the route, but really didn’t do much free climbing harder than 5.9 or 5.10 (once you count pulling on gear to French free). We didn’t place a single nut on the route, but if you were to place nuts, the most useful would be a single set from #2 to #6 DMM offset brass nuts. At LEAST one full set of offset cams and multiples of good small cams make things much easier. A couple camhooks and a grappling hook should be plenty for hooks. Another huge time saver (especially on places like the stove legs) is crack jumaring with your daisies (and no aiders). Just walk pieces up, using your feet in the cracks (the leader should always be wearing comfy free climbing shoes for the Nose). We ended up doing the Jardine Traverse (which felt like 5.10something face climbing even when aiding on the bolts) instead of King Swing. Yea, there are many different ways you could do KS. The best way would depend on how long your lead and haul lines are, if you have a separate lower out line (and how long it is), and how many people are in your party. It seems like most people do it the straight forward way of hauling to the top of Boot Flake, the leader doing KS, and then lowering out the haul bag and second. This seems like a lot of wasted work to us. I would say to just think about it and do it the way that makes the most sense to you. The leader retying through the KS anchor, lowering, and back-cleaning everything could be useful this way the second wouldn’t need to top out the Boot Flake (just to do a huge lower out). There are a few options of what to do with the haul bag for this of varying complexities and sketch-factors. Other recommendations we came up with: Lead in big blocks. Don’t have daisies attached to your aiders (but don’t drop them!). Bring plenty of poop bags. Pick up and pack out any trash you see. Make sure you can rap with a haul bag when your exhausted (for the East Ledges descent). Make sure your competent at everything in Chris’ book before you go up as it’s really tailored for doing well on routes like the Nose and will allow you to enjoy the experience much more! Hope this helps! Would love to hear how it goes for you. Goodluck and enjoy! Great piece of writing Gina. You have a real talent and Susan and I really enjoyed reading. Love to you and Adam.